Strategist Says Gonzales Is "Finished"
Pressure mounted on the White House Thursday to fire Attorney General Alberto Gonzales for the abrupt dismissal of U.S. attorneys. More Republicans called for his ouster, and one Republican strategist close to the White House told CBS News that Gonzales is "finished." Congressman Dana Rohrbacher became the latest Republican to say Gonzales should go, reports CBS News White House correspondent Jim Axelrod. "Even for Republicans this is a warning sign … saying there needs to be a change," said Rohrbacher. "Maybe the president should have an attorney general who is less a personal friend and more professional in his approach." Meanwhile, the Senate Judiciary Committee Thursday cleared the way for subpoenas compelling five Justice Department officials and six of the federal prosecutors they fired to tell the story of the purge. The voice vote to authorize the panel to issue subpoenas amounts to insurance against the possibility that Gonzales could retract his permission to let the aides testify voluntarily, or impose strict conditions. The committee also postponed for a week a vote on whether to authorize subpoenas for President Bush's top aides who were involved in the eight firings, including political adviser Karl Rove, former White House Counsel Harriet Miers and deputy White House Counsel William K. Kelley. The committee approved subpoena power for key Justice Department officials involved in the firings: Michael Elston, Kyle Sampson, Monica Goodling, Bill Mercer and Mike Battle. Sampson, Gonzales' chief of staff, quit this week. Elston is staff chief to Deputy Attorney General Paul McNulty, and Mercer is associate attorney general. Goodling is Gonzales' senior counsel and White House liaison, and Battle is the departing director of the office that oversees all 93 U.S. attorneys. Gonzales has said he would allow the aides still at the Justice Department to testify voluntarily. It was unclear whether Sampson would agree to tell his story without a subpoena. The panel also approved subpoena power for six of the eight U.S. attorneys fired since December. The six, all of whom testified last week under oath before the House Committee, are: Carol Lam of California, Bud Cummins of Arkansas, Paul Charlton of Arizona, John McKay of Washington state, Daniel Bogden of Nevada, David Iglesias of New Mexico. The subpoenas are a warning to the embattled administration to follow through on promises in recent days by Gonzales and President Bush to tell the whole story of the firings, beyond the selected details that Associate Deputy Attorney General William Moschella revealed to the House panel last week. "I want to obtain their cooperation and all relevant information," Leahy said. "But I want people to know that if I do not get cooperation, I will subpoena, we will have testimony under oath in this committee. We will find out what happened." 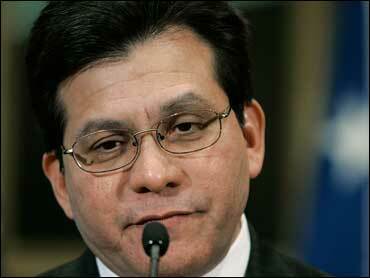 Gonzales' tenure has been tangled in controversies, reports CBS News correspondent Bob Orr. As the president's chief lawyer, Gonzales sanctioned the widespread use of "warrantless wiretaps," allowing the government to snoop on Americans without court orders. Citing an urgent need to prevent terror attacks, he also approved the so-called "torture memo," clearing the way for the CIA to use harsh methods in questioning al Qaeda captives, adds Orr. Sen. John Sununu of New Hampshire on Wednesday became the first Republican to call for Gonzales' ouster. That came just hours after Mr. Bush gave the attorney general, a longtime friend, a vote of confidence. "I think the president should replace him," Sununu said in an interview. "I think the attorney general should be fired." Although some Republicans have been tepid in their support for the attorney general, Sununu was the first to go so far in the uproar over the Justice Department's firing of the attorneys and its response to congressional questions, plus a separate report that the administration abused its power to secretly investigate suspected terrorists. The White House issued a curt response to Sununu's remarks. "We're disappointed, obviously," White House spokesman Tony Snow said. A Justice Department spokeswoman refused to comment. Speaking to reporters in Mexico before returning to Washington, Mr. Bush expressed confidence in Gonzales and defended the firings. "What Al did and what the Justice Department did was appropriate," the president said. Still, Mr. Bush left himself room to sack the attorney general. "What was mishandled was the explanation of the cases to the Congress," Mr. Bush said. "And Al's got work to do up there." Gonzales, expected to meet with lawmakers this week, has been fending off Democratic demands that he resign over the ousters of the eight U.S. attorneys, which Democrats have characterized as a politically motivated purge. "We want Congress to know, to understand what happened here," Gonzales said. "We'll work it out." Mr. Bush isn't the first president to fire U.S. attorneys and replace them with his own appointments, reports CBS News senior White House correspondent Bill Plante. At the beginning of his first term, President Clinton cleaned house, ousting all 93 U.S. attorneys, which is not unusual; they serve at the pleasure of the president. The difference this time is the charge that politics apparently played a role in their dismissal.